In mail server management it’s important to learn the difference between mail protocols IMAP and POP. Most of the core Internet users should have heard of the E-mail Protocols – POP3 and IMAP. In this post, I’ll explain the concepts. Internet Message Access Protocol (IMAP) is an Application Layer Internet Protocol. It listens to Port 143. IMAP allows a user to access E-mail which is stored on a Remote Server. IMAP is used to retrieve messages from a Mail server. In IMAP mode, Multiple E-mail clients can interact to the same account on the server, from anywhere. Also, E-mail clients can talk to multiple servers. Its upto the E-mail client who decides about the storage of messages – either locally or leave them on the server. 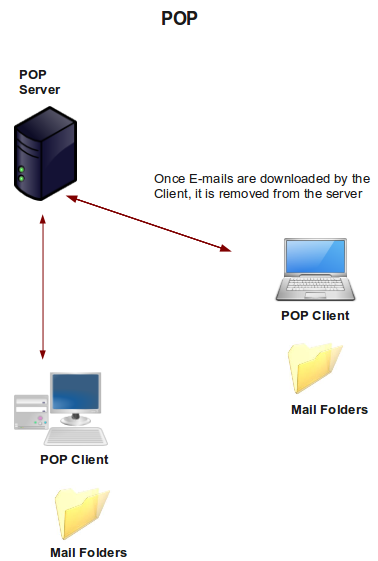 1) Continuous mode of Connection : Using IMAP a client can interact with the Mail server throughout, whereas using POP, this would be impossible. POP connects to the server for the retrieval of new messages. With an IMAP connection, as long as the User interface is active, it connects to the server and download content. 2) Multiple mailboxes : IMAP clients can create, remove, rename mailboxes in the server and allowed to move messages between the folders. 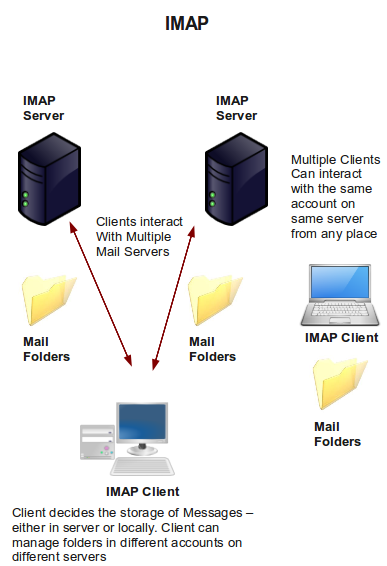 3) Simultaneous Connection : POP allows only one client (currently connected one) to the mail server, whereas IMAP allows multiple clients simultaneously connected to the server and manage it. Changes made by the clients will be updated concurrently. Before we go, there is one more thing to explain. Since IMAP allows multiple connections, we need to type a command tag before we enter the actual command. This could be anything – like a period (.) or numbers or alphabets. The server will respond with the command tag we entered, indicating the connection we use. For example – I have used a period (.) and the server will respond with the . tag along with the output of commands. If another user inputs the command tag as 1 or a then the server will bind its response with the command tag 1 or a. * LIST (\HasNoChildren) "." "INBOX.test44"
* LIST (\HasNoChildren) "." "INBOX.test_imap"
Note that the command tag ‘a’ is added to the response returned by the server, in the rest of the blog, I’ll be using . * OK [CAPABILITY IMAP4rev1 UIDPLUS CHILDREN NAMESPACE THREAD=ORDEREDSUBJECT THREAD=REFERENCES SORT QUOTA IDLE ACL ACL2=UNION STARTTLS] Courier-IMAP ready. Copyright 1998-2008 Double Precision, Inc.  See COPYING for distribution information. The List command displays all mailboxes on the server. The argument “” “*” displays all the mailboxes including sub folders. The Status command return some basic information on the folder (without accessing it), the following command returns the information about INBOX. The Select command return the information about the folder specified, further allowing to access Mails inside it. Select returns a Read-Write reference of the folder where Examine returns a Read-only reference of the folder. Fetch command is used to access E-mails. It has many options based upon what we choose to see. The avaialble options are to see Headers, Message Flags, Body Text. * LIST (\HasNoChildren) "." "INBOX.test3"
STORE message +flags [flag list] – Adds the [flag list] flags to the chosen messages. STORE message -flags [flag list] – Removes the [flag list] flags from the chosen messages. 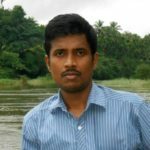 STORE message flags [flag list] – Resets the flags to [flag list] on the chosen messages (the same as removing all flags and then adding [flag list]. * 1 FETCH (FLAGS (\Deleted) INTERNALDATE "15-Jan-2011 10:50:17 +0530" RFC822.SIZE 2127 ENVELOPE ("Sat, 15 Jan 2011 10:50:12 +0530" "Test Message" (("support team" NIL "examplesupport" "gmail.com")) (("support team" NIL "
" "gmail.com")) (("support team" NIL "
* 1 FETCH (FLAGS (\Deleted NonJunk) INTERNALDATE "15-Jan-2011 10:50:17 +0530" RFC822.SIZE 2127 ENVELOPE ("Sat, 15 Jan 2011 10:50:12 +0530" "Test Message" (("support team" NIL "
. OK [COPYUID 1295001279 1 1] COPY completed. Both commands will permanently delete a message with the label ‘\deleted’ (which is set for deletion). The difference is that Expunge command removes a message, while Close command removes the message as well as deselect the current folder. We’ll need to select a folder for any further operation.
. fetch 1 all                // Current folder is still INBOX, Not deselected.
. fetch 1 all            // To verify that the current folder has been deselected.
. NO Error in IMAP command received by server. 1) In Single User mode, you can rely on POP3, since it downloads all E-mails from the server and further erases it. 2) Since the E-mails are stored in your PC, you can access your mails without being connected to the Internet. 3) Handling Mail attachments are quite easy, because they will be downloaded to the PC while downloading E-mails. 4) There is no maximum size of your mailbox, its virtually the storage capacity of your machine ! It responds with the lists a line for each message with its number and size in bytes. This unmarks or resets the messages set for removal. This deletes the messages set for deletion and logs out of the server.